For more information, check out the Import/Export topic. XamlDataProvider: Use when you want to bind XAML source to RadRichTextBox. HtmlDataProvider: Use when you want to bind HTML source to RadRichTextBox. RtfDataProvider: Use when you want to bind RTF source to RadRichTextBox. DocxDataProvider: Use when you want to bind a docx source to RadRichTextBox. TxtDataProvider: Use when you want to bind plain text source to RadRichTextBox. Data providers have to be declared in the visual tree and not the Resource dictionary of a control. You don't have to worry about the place in the visual tree where a provider is, as it does not have a visual representation. RadRichTextBox's data providers encapsulate the logic of the format providers that come with the control. What they do internally is import/export the document using the respective format provider. By default, the property in your view model will be updated on each document change. As this triggers an export to the document you might notice some delay when typing in the control. You could try customizing this by setting the UpdateSourceTrigger property of the data provider to LostFocus or Explicit. RichTextBox: Specifies which RadRichTextBox instance this data provider is attached to. String Value: Specifies the input/output of the DataProvider in the respective format. The name of the property is Xaml for XamlDataProvider, Html for HtmlDataProvider, Text for TxtDataProvider and Rtf for RtfDataProvider. An exception to this rule is the Docx property of DocxDataProvider which is a byte array. It is best to declare data providers in the visual tree, as this way the binding will be properly updated when the data context is changed. You don't have to worry about the place in the visual tree where the provider is, as it does not have a visual representation. Each DataProvider class is located in the same assembly as the corresponding FormatProvider class. For example, the XamlFormatProvider class is in the Telerik.Windows.Documents.FormatProviders.Xaml.dll assembly. Only the TxtDataProvider is located in the Telerik.Windows.Documents assembly. In order to use a data provider, make sure to have referenced the required assembly. 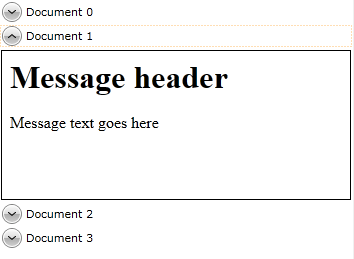 In Example 2, two simple UI controls are used - a plain RadRichTextBox and a TextBox, which will display the document as a XAML text. The main functionality is contained in the XamlDataProvider class. It's attached to the RadRichTextBox and its Xaml property is data bound to the TextBox's Text property. At some point, you may want to start customizing the documents' appearance or modify the document after it has been imported but before it is shown. Data providers facilitate this by exposing a SetupDocument event. It's fired every time the data provider instantiates a new document so you can modify the document. The following code-snippet demonstrates how to do that. In the previous example, the document's LayoutMode property is changed. However, you can apply any number of modifications to the document. The DataProviders can also be used in DataTemplates to enable DataContext binding. Example 5 shows using RadRichTextBox in ItemsControl. For each item in the ItemsSorce collection an expander is created. The content of the expander is RadRichTextBox control bound to the Body property of the DataContext through HtmlDataProvider. The data providers internally use the corresponding format provider classes, which are automatically loaded by MEF. Sometimes the MEF fails to load a format provider and a NullReferenceException is thrown.